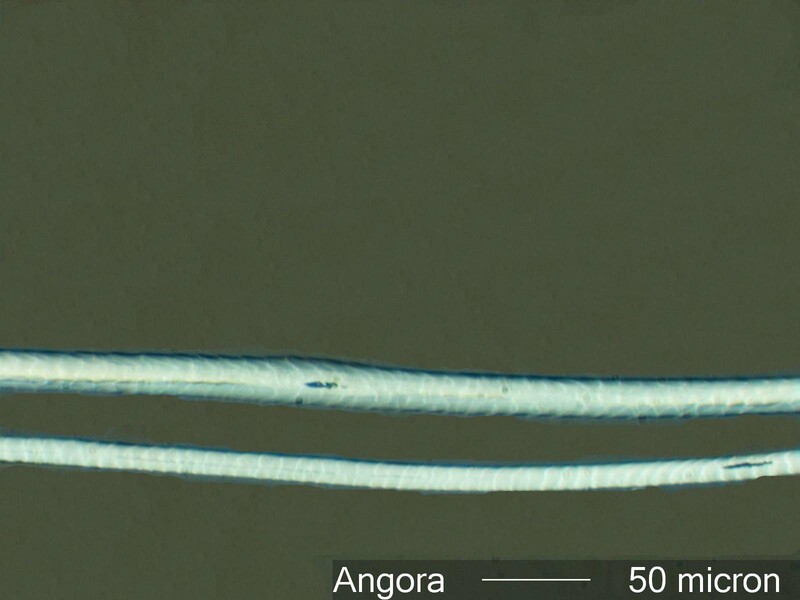 This is a sample of angora hair from the sample-set provided by Textile Fabric Consultants, Inc.
Angora rabbits provide a hair useful for commercial textiles. Each rabbit provides about half to nearly a pound of fiber per year. The fleece hair is very fine, about 10 to 18 micrometers in diameter. This gives the hair its most desirable properties. The collection of good quality angora hair is labor intensive, resulting in its higher cost. Angora rabbit hair is generally from knitted clothing of high quality. It may on rare occasions be present as pet hair. It is present in large quantities at sites working with the commercial aspects of angora textiles or the rabbits themselves. Angora hair has a refractive index along its length of about 1.56 and perpendicular to its length of about 1.55. It has a birefringence of about 0.01 and a positive sign of elongation. The finer hairs often do not have a visible medulla. When the medulla is present it is uniserial in the smaller hairs and multiserial in the large hairs. The cuticle pattern varies from a wave mosaic on the larger sections of the hair to a chevron on the finer sections.